After the blood, sweat, and tears is finished, and the article summarizing your wonderful research is ready to be submitted, well then there’s the submission process itself. Submitting articles to journals varies in difficulty with some allowing just a PDF of everything at once, and others requiring each table and figure to be uploaded as a separate file with sequential names. Frequently, images are best kept in a vector format for high-quality reproduction, and so this limits possible formats for uploading. And the final hurdle is that often the images are pasted (in context) into a MS Word document and so must be extracted for uploading to the submission engine. So, starting from having an MS Word (docx) document with embedded vector format figures, here is a useful workflow to quicken things. 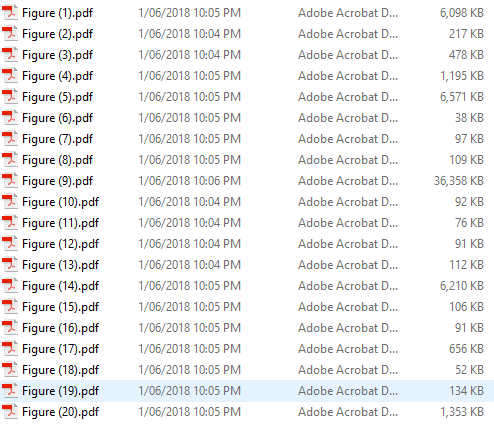 which converts all the *.emf files to *.pdf files keeping the same filenames. the --% is so that Powershell does not try to parse the following text, but passes it directly to the previous command, mogrify. Now you will have image2.pdf, image4.pdf and so on. Finally, these PDF files now correspond (presumably) to Figure 1, Figure 2, and so on in the document. The next step is to rename image2.pdf, image4.pdf and so on to Figure 1.pdf, Figure 2.pdf, and so on. To do this, select all the PDFs and right click on the first one in the sequence and select Rename. Type “Figure” and press enter. 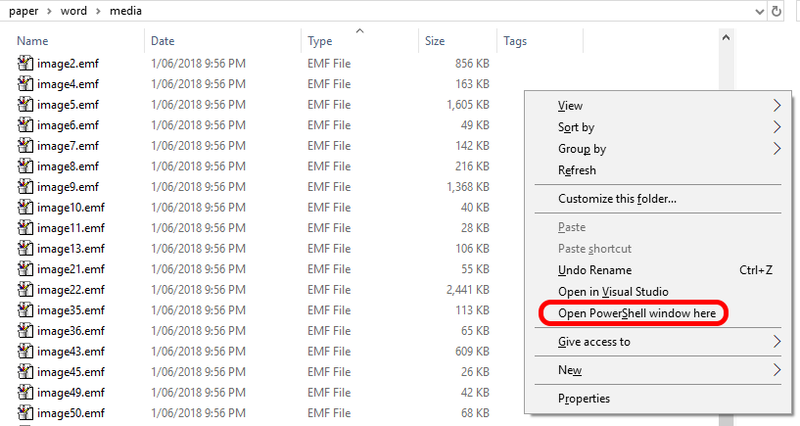 Windows Explorer automatically recognizes that there will be multiple files with the same name and so labels them Figure (1).pdf, and so on. note that the ” (X)” is added to each filename (including leading space), where X is the index of the file. With this, you should now have the PDFs named correctly, and read for copying back to the main folder and batch uploading. You can delete the ../paper/ folder now (original extracted from zip file). With some further fancy PowerShell commands, the parentheses can be extracted from the filenames if necessary. I really like ImageMagick. I haven’t done much with it recently, but a few years ago I looked at using it in combination with Excel to try and get my photo records under control. I really should get back to that!